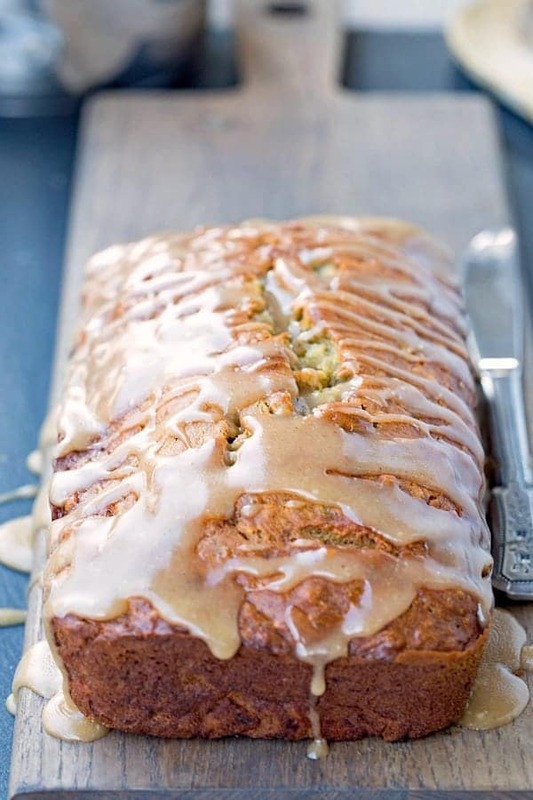 Brown Butter Glazed Banana Bread is a moist banana bread drizzled with a sweet, buttery glaze! Tomorrow is Thanksgiving, but I’m sharing something that’s decidedly un-Thanksgiving-y today. After all, there’s never a wrong time of year to enjoy a yummy slice or two of banana bread. 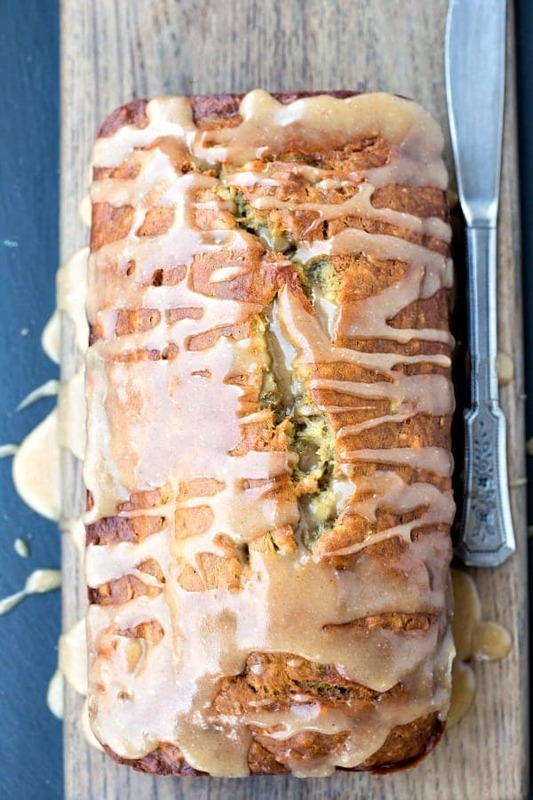 And this Brown Butter Glazed Banana Bread certainly is yummy! The banana bread itself is soft and moist and almost cake-like. It’s topped with a rich, buttery glaze that is crazy good. So good that you’ll want to drizzle it over everything – that kind of good. So, if you find yourself with some overripe bananas over the holiday weekend, do yourself a favor, and make this banana bread! 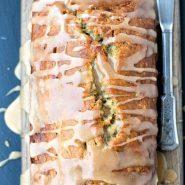 If you’ve tried this brown butter glazed banana bread recipe, don’t forget to rate the recipe and leave me a comment below. I love to hear from people who’ve made my recipes! You can SUBSCRIBE to receive my latest recipe newsletters or FOLLOW ME on FACEBOOK, INSTAGRAM and PINTEREST for even more delicious food. Preheat oven to 350 F. Grease a 9x5-inch loaf pan; set aside. In a large bowl, beat bananas until mashed. Add butter and sugar, and beat until well-combined. Add flour, baking soda, and salt; stir in until just incorporated. Bake for 45-55 minutes, or until a toothpick inserted in the center comes out clean. Let cool in pan for 10 minutes, and then remove to a wire rack to finish cooling. To make the glaze, add butter to a heavy saucepan. Cook butter over medium heat until it starts to foam, stirring frequently. Stop stirring, and let it continue to cook until amber brown. Remove from heat, and stir in powdered sugar and enough milk to make glaze desired consistency. If your powdered sugar is lumpy, sifting it will help make the glaze smoother. Drizzle over cooled banana bread. I tried your recipe & we loved it. I decided to find a new banana bread recipe because the one I had been using was just too sweet. I tried 2 recipes on the same day & this was the winner. The other had less banana & more sugar. We like walnuts in ours so I will add some next bake & we left off the glaze, just didn’t need it for us. Thank you for sharing. Thank you! I’m glad that you liked the banana bread. =) Thank you for taking the time to come back and comment. Yay! I’m glad you liked it! It will depend on what size mini pan you use. I’ve used an 8 mini loaf pan in place of a 9×5-loaf pan in other banana bread recipes. I just baked it at the same temperature for about 18-22 minutes. Hope that helps! At what temp and how long do I bake, if I were to use a small 3.5x 5.75″ loaf pan. Or if I wanted to do it as muffins instead. Would it still work? When I bake in smaller pans, I just reduce the baking time, but I don’t change the oven temp. I would guess (and it’s a guess since I haven’t tried it with this recipe), that it would take about 20-25 minutes in 3×5-inch pans. I also think it would work as muffins. Again, though, I haven’t tried turning this recipe into muffins, so I can’t say for sure. Good luck! I don’t understand why it says 1 cup 1/2 so flour? 1 cup or 1 1/2 cups? Confusing! It’s 1 1/2 cups of flour. Many of my recipe re-formatted themselves when there was an update, and I’ve been working my way through the 400+ recipes on my site trying to correct any issues like this. I just made this. I added walnuts and pecans to the top of my bread since we love them on banana bread. It is delicious. The sweet buttery glaze is an excellent touch! I love Brown Butter recipes,. such a nice and unique flavor. Me too! =) It really is!